Prayer stall carved 1930 Mrs S. Ayton, Holy Trinity Church, North Hobart . Who was Nellie Payne? Close up inscription on Susan Ayton prayer stall. 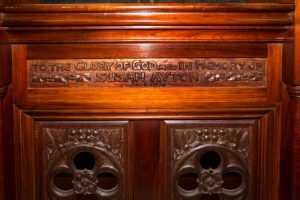 Yesterday morning at Holy Trinity a service was held at which the rector (Archdeacon Blackwood) dedicated a fine carved stall and dais in memory of the late Susan Ann Ayton. The Bishop’s faculty for the dedication was read by Rev. W. R. Barrett, Warden of Christ College, and Rev. E. C. Spink assisted in the service, reading the epistle. The stall is a very handsome addition to the furnishings of Holy Trinity. It consists of a prayer desk and seat, of upright design, supported by columns and finishing in a semi-circle above. 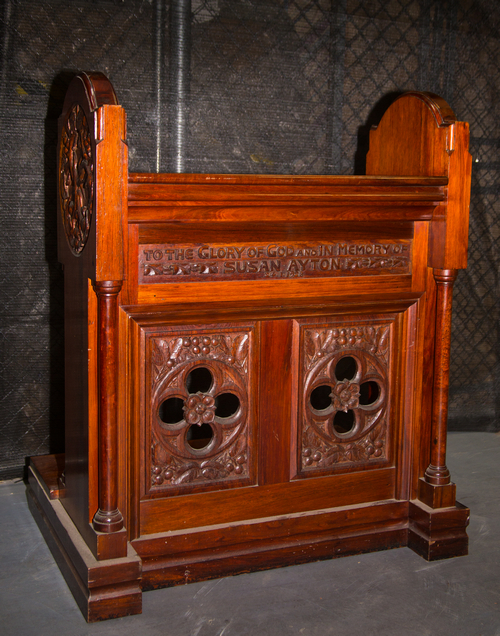 The panels on the sides and front of the prayer desk are beautifully carved, depicting intertwined glastonbury thorn and berries. 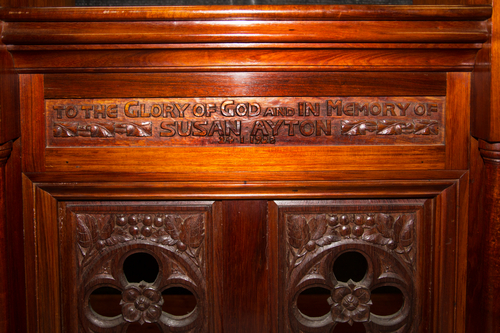 The inscription, carved on the front, reads: “To the glory of God and in memory of Susan Ayton, 24/1/28.” The stall is erected on a commodious dais, situated between the choir stalls and the nave, running the whole width of the chancel. 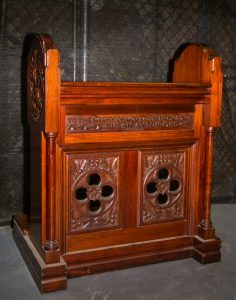 The work is carried out in Tasmanian blackwood, and reflects great credit upon the designer and carver, Mrs. C. Payne, and the cabinetmaker. Mr. G. Triffitt. Mr. A. P. Mc Elwee was responsible for the dais.